Billions of dollars are spent every year on food, supplements and accessories for dogs. Small dogs are toted in their own designer purses and dressed with color-coordinated booties. Specialty toys encourage learning and training. Gift ideas for small dogs can be a little overwhelming. If you are looking for unique and memorable gift ideas for small dogs, start by thinking about the dog lover that calls themselves mom or dad. Dog lovers stop at nothing to find the latest trends for their baby. Here are some great gift ideas for dog moms and dog dads everywhere. Gift ideas vary depending on the reason for buying a dog gift. 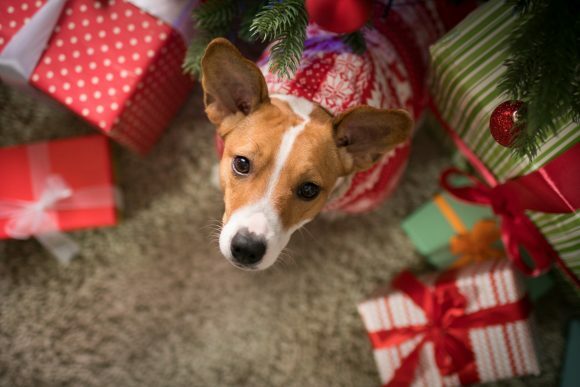 While most dogs find presents under the Christmas tree or for their birthdays, there are many other times of the year to get a dog or its owner a present. Holiday gifts for small dog owners start with traditional reindeer ears, peanut butter dog biscuits and flannel pajamas to sleep by the fireplace waiting for Santa to come. There are many other great gift ideas for dogs during the holiday season. Pet Pillow: What dog doesn’t need a new cozy pillow to lay his head on while waiting for his owner to start his favorite movie, Lady and the Tramp. Holiday pet pillows help small dogs fall fast asleep so the reindeer can land on the roof undetected by alert ears. Dog Jacket: The snow and freezing conditions of winter mean that even the thickest dog coats can leave a dog chilly. Small dogs often start to shiver. Keep those pups warm during the snowball fight with a jacket that is both stylish and functional. DNA Test: Dog owners always wonder about the actual breed of dog they have. Even a papered pure breed might have traits suggesting some breed other than it’s known parents. A DNA test is not just interesting to understand the quirks of man’s best friend, but let pet owners mitigate potential health issues. Personalized Stocking: All family members should have a stocking on the mantle. Give a small dog an extra special stocking with her name stitched in. Once filled with her favorite dog treats, she’ll Santa thought she was a good girl. Bow Tie: The holidays are filled with many holiday parties. Prep the pup in style with a fashionable bow tie collar. “Dog Perignonn” Plush Toy: Let the pup ring in the New Year with his very own plush bottle of Dog Perignonn. He’s sure to be the life of the party without needing to worry about being the designated driver. Family Matching Pajamas: Nothing says family more than matching pajamas. Now families can get a pair for mom, dad, kids, dogs and even the family cat. Enjoy a night in with the entire family watching a movie and cuddles on the couch. Moncler Mondog Jacket: The dog wearing the Moncler Mondog Jacket is the style-envy of the neighborhood. Both stylish and warm for those cold winter walks around town, this jacket comes in a variety of colors to go with a small dog’s favorite colors. Heated Pet Bed: Since dogs can’t have hot chocolate, give them a heated pet bed to cozy up while mom dog enjoys a cold winter’s indoors. A safe way to keep your dog cozy without having them steal your covers. Paw Print Ornament: A little craft-time together helps a family bond. Paw print ornament kids are located at most craft stores where mom dogs and dads can create a unique keepsake Christmas ornaments for the tree. When a small dog moves into his new home with his parents, he can feel a little overwhelmed. Few things are familiar and most of his items may even be packed away when he first gets home. But new digs mean new things for that furry friend. Here are some gifts for the dog that needs to set up his new dog pad. Sheffield Dog Bed: Every dog loves being the king of the castle and nothing says “king” better than his very own Sheffield Dog Bed. The sleigh bed platform design is easy for him to climb in, feel safe and cozy and leave dog owners a little more space on their own beds. Flirt Pole: Small dogs like hunting little critters just as much as kitty cats do. In fact, many dog breeds are bred as critter hunters. This is why the flirt pole resembling a fishing pole is a great gift idea for the pet owner who wants to keep their puppy busy without a lot of running around themselves. Tornado Treat Dispensing Dog Toy: The smart toys are all the rage because large and small dogs alike are starting to do algebraic problems. To help dogs get ahead of the puppy training curve, a Tornado Treat Dispensing Dog Toy forces the dog to work the puzzle before the treat is accessible. BarkBox Gift Subscription: Dogs don’t bark at the mailman when their own little care package arrives every month. The Barkbox comes filled with seasonal treats, chew toys and special toys that will have your dog jumping in to get started. Neater Feeder: Even small dogs benefit from the ergonomic design of the Neater Feeder. Not only does this food dish holder keep a dog’s head perfectly aligned, but it also keeps feeding time clean without slashing of water and overflow of food. Pawdicure Kit: Give small dogs a little pampering with a pawdicure in between grooming sessions. Working with your small dog’s claws not only keeps him healthy but is an important bonding where a dog builds trust with its owner. Insect Repellant Bandana: A simple and stylish way to protect dogs from fleas, ticks, mosquitos and flies when away from home. The bandana is odor-free but treated with repellant that withstands up to 70 washings. Sleepypod Mobile Pet Bed & Carrier: Make traveling as luxurious as home for your small dog. This mobile pet carrier has a cushioned bed to helps pets feel safe and comfortable. Less stress on pets leads to more enjoyable excursions for the entire family. Pet Stroller: That tiny four-legged furball just can’t always keep up with the pace of an active family. But no one wants to stay at home. A pet stroller lets small dogs enjoy a day out with the perfect place to rest while on the go. Holidays throughout the year are a great way to let that small dog and his owner know how much you care. Whether a Mother’s Day gift to honor the dog mom or graduation gifts to celebrate training success, get in the party mood with these small dog gift ideas. Bone Toggle Collar: For the stylish pup in your life. This leather toggle style collar will make any small dog find their big dog posture. It’s the perfect accessory to a day out shopping with mom. Pet Wi-fi Camera: A perfect gift for the pet owner who feels guilty about leaving Fifi at home alone. The pet wi-fi camera lets pet owners see their pets while they are away. Interactive options even reward the pet for answering the call. Dog Breed Chef’s Apron: A chef’s apron is the perfect companion to your companion helping catch those accidental scraps that make their way to the floor. Honor that little taste tester with the ultimate in kitchen styles with a special dog breed chef’s apron. Friendship Collar and Bracelet: Like mom dog, like dog daughter. Isn’t that how the saying goes? This friendship collar is the ultimate matching accessory that gives mom a bracelet that matches a stylish collar. Pet Massager: Even dogs need some help with rest and relaxation and the pet massager is the perfect solution. A couple of rolling balls that guide along the back muscles of your pup will certainly relax their body after a busy day playing fetch. Pooch Selfie Ball: No mom dog or dad is without a phone full of dog photos. But selfies can be hard with the little pooch distracted. Solution: the pooch selfie ball sits over the phone so the dog’s attention is on what they want, the ball. Fetch Machine: It isn’t always convenient for dog parents to play fetch. But that little puppy doesn’t need to wait if he has his very own fetch machine that launches a ball down the hall or across the backyard. He brings it back, drops it in and starts all over for hours of fun. Dog Teepee: Stylish and practical, small dogs love having a dog teepee. It gives them a place of seclusion to sleep and adds a fun whimsical element to a room compared to a traditional dog bed. Personalized Pet Harness: Many pet owners use a harness for their dogs to make walking and handling a little safer for both. A personalized pet harness embroiders the dog’s name and contact information on the harness. Customize color combinations to match the dog or his owner’s personality. Socks or Leggings: Get customized socks or leggings with your dog’s picture on it. With low-cost drop shipping imprint companies, these are easy to do and a fun way to always keep your dog with you. Fast Book: Every dog has a story and a fast book helps tell that story in your favorite pictures. These are small so they can easily fit in a purse to show your small dog off when he can’t be there with you. Doggie Clone Plush: Send a picture in and get a little plush copycat of your dog – well copydog. Your dog may be confused with the intruder that looks like the one in the mirror but he’ll grow to love his plush companion as much as you do. It’s hard to talk about the grief of losing a dog. For the mourning dog owner, it can be hard to describe the emptiness that happens with a void that doesn’t seem like it could ever be filled. If you know someone who has just lost their dog or is spending their first holiday without their furbaby, think about a gift that will not just be a beautiful memorial but opens the door for a conversation to help them get through the grieving process. You could get a personalized memorial stone or cremation urn that becomes a beautiful celebration of the life for the dead dog. Hand drawn sketches and portraits are another way to memorialize a dog that has died. Some companies offer sympathy boxes for pet owners in grief and many charities will allow you to donate on behalf of a pet owner in memorial of their loved dog. With so many great ideas, how does a gift-giver choose? Consider the personality of the pet, the personality of the owner as well as any allergies or health restrictions the pet may have. Also, consider the lifestyle of the dog family. It doesn’t give anyone any enjoyment if a gift just doesn’t fit what the dog and his owner do regularly. There are a lot of toys on the market for dogs. Heck, most dogs can enjoy a good stick to gnaw on. This means that dog owners and gift givers need to be aware of potential choking hazards. Just like kids, there are many toys not made with safety in mind and the pet industry is not regulated in the same fashion as for human babies. Be aware of plush toys that have parts such as eyes or buttons that easily come off and choke a small dog. The inside of the toy is also a danger if the dog ingests the stuffing of the plush. Rawhides, antlers and bones also become choking hazards and in some cases lead to digestive issues. Always supervise dogs with toys and remove the toys when they start to break. When buying toys, look for items that don’t have a lot of extra parts sewn together or added on. The less there is to break off, the easier it is to manage the dog’s play with the item in a safe fashion. If you are concerned with whether a dog product is deemed safe, go online to see what others are saying about the product. Does it last long or get destroyed quickly. The Center for Pet Safety does a lot of safety tests and ratings of products found in the market to give a more scientific review of dog toys, carriers and other products. Some dogs just can’t have the same types of food or treats as others. Deficiencies in many popular dog brands have led to allergies, digestive issues and weight problems for some dogs. If you plan on buying specialty treats of any sort, make sure it won’t create a health issue. Small dogs watching their waistline need low-calorie treats. Don’t let the size of the treat fool you. There are recipes that let a small dog have a big treat designed to fill him up with fewer calories. Ask questions about ingredients. Many dogs have sensitive tummies. Treats that are too rich in protein might lead to diarrhea. Just like humans, some dogs might also have allergies to things like peanuts, thus peanut butter treats are out of the question. While most pet owners know what their dog can or can’t have, a gift giver should ask to make sure everyone remains healthy and happy. A fetch machine is a great idea until you realize that the dog could care less about chasing after a ball. As hard as it is to believe, many dogs don’t have the attention span for extended periods of fetch. Buying a play gift for a tog means understanding the dog’s personality. Retrievers and many sporting dogs love to play fetch and will go nuts with anything that makes the game even better. Then there are hunting dogs like little terriers that really love squeaky toys as they play the hunter around the house. And then you have those, like the pug, whose favorite game is sleeping on a friendly lap. He’d probably love the matching pajamas. Spend the time to learn about the dog, its breed when possible and regular habits to find a present that matches the dog with the best possible present. Dogs might choke on some toys; people tend to choke on the sticker prices of pet products. American pet owners spent nearly $70 million on their pets in 2017 meaning it can be easy to rack up some costs with pet gifts. Quality gifts are not cheap and finding that special something that is as unique as the relationship between a dog and his owner means specialty gifts. Buying a present for your own small dog is easier than buying one for a friend. After all, money is no object for your own furbaby. Plus, there isn’t a guarantee that Fido’s friend will love what he does. Set a budget before you start shopping for gifts. This gives the search a narrow focus. Then create a list of gift ideas. You might not be able to afford the Moncler Mondog Jacket, but if you know that is what you are looking for, you can start to look for similar items at a better price point. Whatever you end up buying, check reviews to make sure the product is good quality and not hazardous.